Gmail unveiled yesterday a slew of new features for the Promotion Tab in their iOS and Android Gmail app. Technically some of these changes have been out for a while as early as as April of this year. In fact, Jordan Grossman, Google’s Product Manager of Gmail and Gmail ads gave a presentation on these features at the DDMA Email Summit in Netherlands back in July. The new features include Single Image Previews, Deal Badges and Custom Logos although Jordan’s presentation also covered several “upcoming” features such as Topic Bundles and Catalog Cards. 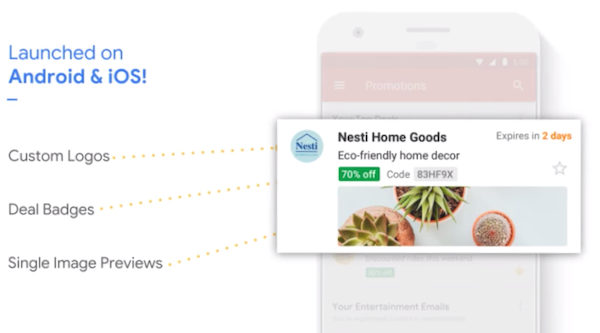 Google terms these features as Annotations as senders would “annotate” the emails with Schema markup that allows Gmail to pick up these features. Can’t wait to try it? Send yourself a test here. 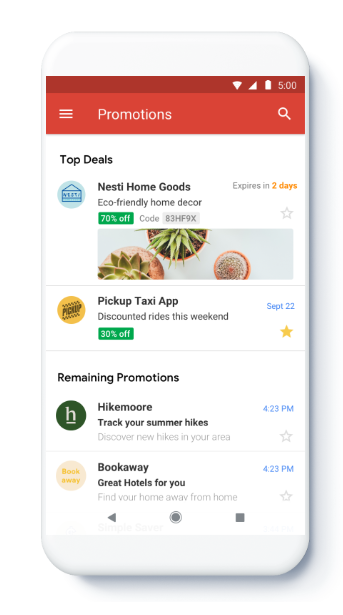 Before we go into the details, know that your email will display with these features only if it is featured in the Top Promotions section in the Gmail iOS or Android App. Otherwise it appears below in chronological order. Google has not offered any details how emails are selected to be displayed in the section but read on below for some tips. Promotion Card Image Previews are images that are displayed underneath an email entry in the Promotion Tab. Senders can customize what is being displayed in these previews by inserting some Schema formatted code in the email. The Schema type for Single Image Previews is PromotionCard. Gmail allows two options to embed Schema data. 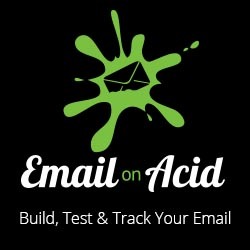 JSON (in the head) of the email or Microdata which fits better in the email body. Also some Email Service Providers strip the JSON code as it is embedded within a script tag. Therefore I prefer the Microdata format. The preview image’s dimension is 538×138 although any image of a 3.9 (width/height) aspect ratio will work. Using images of different aspect ratios will result in the image being cropped (See the Eat24 example below). I reached out to some email marketers that have been part of the beta test on their experience and got a mixed feedback. Generally retailers who embedded imagery of products or call to actions that had a good tie in with their subject line saw a good lift in engagement and click throughs. However, emails that were less product oriented with more generic imagery saw less lift using Single Image Previews – which isn’t surprising actually. Deal badges displays a deal description and promotion code under an email in the Promotion Tab. The deal description is highlighted in green and the promotion code is highlighted in grey. Deal Badges are specified in the email using the DiscountOffer Schema code. The description of the deal. Highlighted in green. As Jordan mentioned in the presentation, Gmail now allow you to set a Custom Logo for your email. From my tests, the Custom Logo is only displayed if your email happens to be displayed in the Top Promotions section. 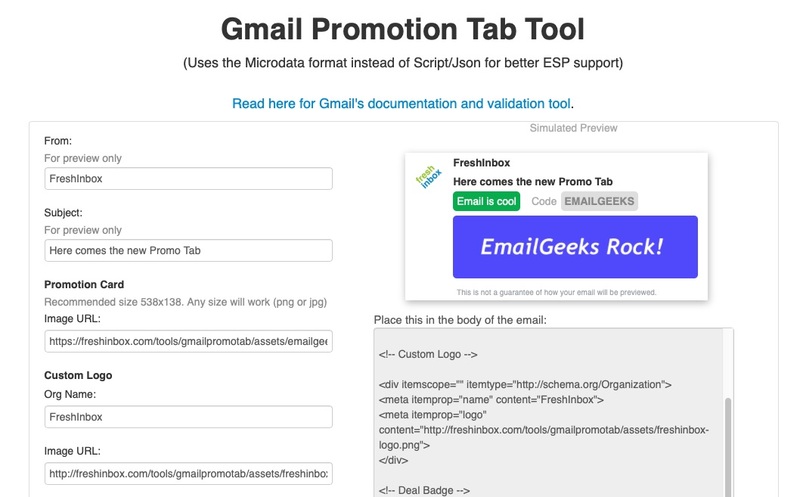 If you want to see how it looks like in your Gmail account, you can use this tool to send yourself an example. It generates the markup in Microdata format which works with more ESPs. Send yourself a test here. Google has kindly put out a “troubleshooting” list. Besides ensuring your emails are properly authenticated, here are a few things I’ve discovered that helps get your email displayed in your Top Promotions list (Unfortunately I don’t have tips on how to get your email to appear on everyone’s Top Promotions yet :) ). If your email appears in the Primary Inbox, move it to the Promotions Tab folder and mark it as unread (by tapping on the envelope icon after opening the email). If you have availability dates, make sure the end date is not in the past. Get rid of other emails in the Top Promotions section by archiving them or refreshing the page. If your Top Promotions section is temporarily empty, try restarting and or updating the Gmail app. Verify that your ESP did not strip the tags by checking the email source. Finally try opening a new Gmail account and sending your test emails to that account. There is no “whitelist” or registration. Anyone can send emails with the new markup and the preview images should be displayed if the email lands in the Top Promotions/Picks section of the Promotion Tab. You can use any image dimensions in your markup – they will merely be cropped if the aspect ratio is off. Do you have any more documentation on the Customn Logos? I cannot seem to get mine to work. Do you need to be registered ( have some profile assigned with your sender address) with Google to make this work? Can anyone use this schema? It appears anyone can use this without registering. 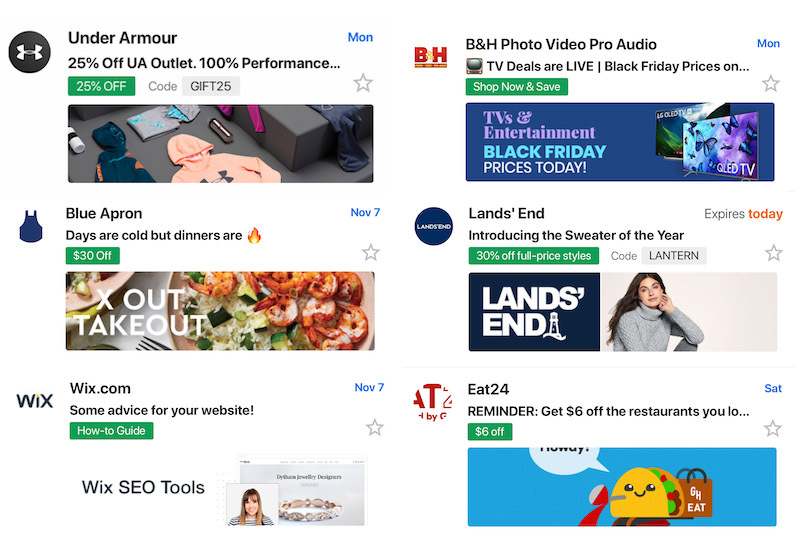 As long as you’re seeing Promotion Cards in your Promotion Tab, you should be able to send one to yourself and as long as the email contains the right markup, is unread and is in the Promotion Tab, it should eventually show up in the Top Picks. How to show the top picks in th promotion tab?Do you success on annotation promotion?If yes,can you send a demo to my email(frankz4735@gmail.com)?Thank you.